A primary focus of Healthy Hydration Education involves the research associated with beverages that are high in sugar calories. 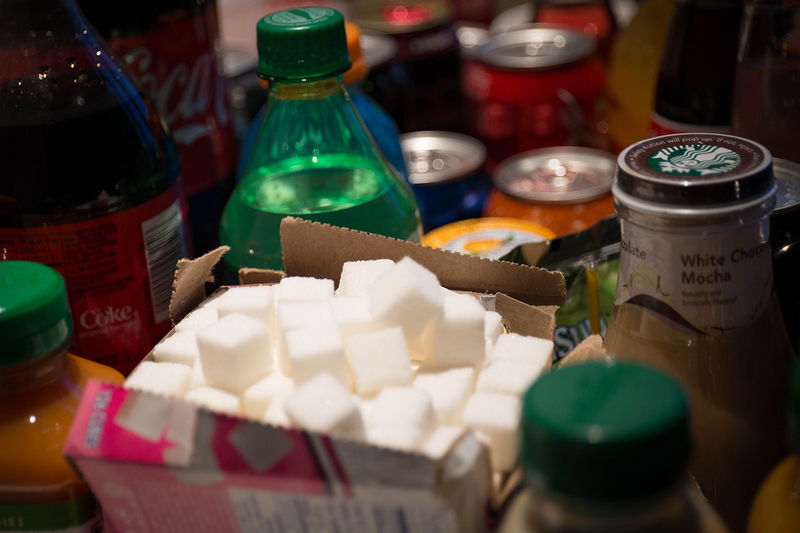 Surprisingly, the main source of sugar in the American diet does not come from desserts or candies, but rather sugary beverages, particularly soft drinks. Sugar that comes from such drinks can be linked to type two diabetes, a number of heart conditions, an increase in general food consumption, in weight gain, and even a lack of essential nutrients in the body. According to the American Heart Association, the average male consumer should not take in over 36 grams or 9 teaspoons and the average female consumer should not take in over 24 grams or 6 teaspoons of sugar each day. 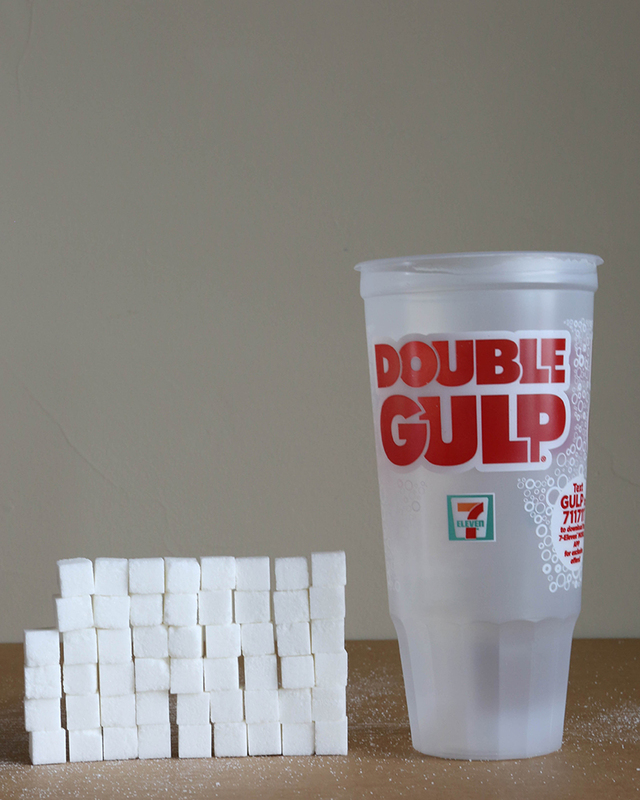 This is about 150 sugar calories for the average male and 100 sugar calories for the average female each day. On the other hand, the USDA has recently issued guidelines for the first time concerning sugar, recommending American males have no more than 200 calories worth of sugar a day and American females about 180 sugar calories a day. Because of this, the FDA, which determines most of the nutritional labels on American food products, recommends an average of 200 sugar calories a day. However, despite what would otherwise be recommended, from 1999 to 2004, children would have about 224 calories every day from just sugary drinks. That might seem like a shocking statistic, but today, one 20 ounce bottle of cola contains about 240 sugar calories, 120% the FDA daily value and almost two and a half times the amount recommended by doctors in a day. 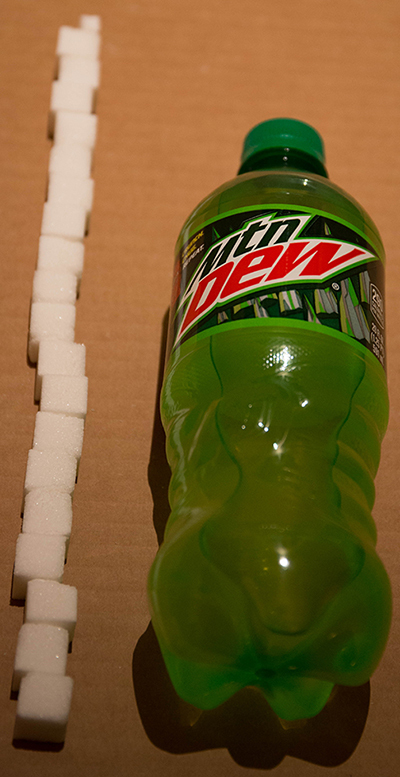 The equivalent of sugar to one of these bottles in teaspoons is a little over 16. In terms of sugar, drinking a bottle of this soda in one sitting is the equivalent to spooning 16 teaspoons directly into your mouth. That might make it easier to understand why in 2012, the average American consumed 153 grams of sugar a day, up to six times the amount recommended. If the amount we should be having ranges from 25 to 50 grams of sugar, at the most, and we consumed only around 9 grams of sugar back in 1822, we should be very capable of meeting a healthy standard. Clearly, we often include too much sugar in our diets, which can cause a number of problems. Sucrose, table sugar for example, causes a number of problems when too much of it is consumed. Sucrose splits into two types of sugar, glucose and fructose. When consumed, glucose spikes blood sugar, and in turn, insulin and other hormones. The increased insulin raises blood pressure and increases the storage of belly fat. Glucose also causes the body to become leptin resistant, preventing it from recognizing when it is full and regulating appetite accordingly. It also increases dopamine, a reward chemical, causing one to eat more and more without ever getting full. The fructose, on the other hand, which can often be found in the form of high fructose corn syrup, goes directly to the liver. From here, it begins to generate belly and liver fat. It increases weight gain and worsens insulin resistance, contributing to even more health concerns. Also, unlike other foods, it also does not slow ghrelin, an appetite hormone, which is intended to create satiety. Sugar creates liver fat, which increases cholesterol, causing heart disease, and building up into fatty liver disease. Sugar increases uric acid in the blood and in turn, increases blood pressure. It worsens insulin resistance, causing obesity and type two diabetes. It also causes Insulin-like Growth Factor, which may ultimately lead to cancer. It does not satisfy an appetite, causing one to consume more of it. It may cause leptin resistance, contributing to obesity. Sugar even attracts bacteria in the mouth, causing tooth decay and gum disease. Basically, it causes a lot of bad things, like obesity, disease, and even tooth decay, but also makes one want and eat more and more of it, causing more bad things to happen, but also causing one to want more as well. In fact, sugar has been shown to stimulate the pleasure centers in mice brains at an even more intense level than cocaine. One, oftentimes an impressionable child, may eat more, causing more bad things to happen, but continuing to want it even more. The cycle continues from there and one may become trapped in a “sugar cycle,” of high daily intake. For a clearer description of what this can do to a person, the Harvard School of Public Health actually performed a study and found that those who drink 1 or 2 sugary drinks a day may gain a 26% increase in the risk of developing type 2 diabetes, a 35% increase in the risk of a heart attack or fatal heart disease, which takes the lives of 1/6th of Americans today, and a 16% increase in the risk of a stroke. Sugar drinks have clearly taken a toll on people’s lives. According to a study from Tufts University, sugary drinks such as fruit juices and sodas actually cause up to 184,000 deaths every year. It seems almost ridiculous that at this point we would allow something like this to happen to us and not know about it; however, there are a number of reasons why it has become harder for us to always understand the problem. Firstly, we rely on it because of its abundance. Today, sugar exists everywhere, even in “healthy products,” even in places that we’d never have guessed. It’s in drinks, tomato sauce, yogurt, cereal, granola bars, coleslaw, barbecue, breads, pizzas, and even potato chips. It exists everywhere. It’s actually quite hard to get away from sugar in today’s market. Secondly, sugar’s many names can make it hard to see how much of the sugar we are consuming. For example, sugar is given many names. It can be easy to find the word sugar on the nutritional label in a product’s list of ingredients. However, it can be harder for everyday consumers to also look out for sucrose, high-fructose corn syrup, barley, malt, dextrose, maltose, rice syrup, lactose, honey, and other “sugar nicknames.” Lastly, Nutritional Labels make it even more difficult to understand the sugar in a food or drink product. Since calorie count alone isn’t always the most reliable way to determine a healthy diet, we use nutritional labels to help see what’s in a product, like a drink. One may notice that they include a %Daily Value, approved by the FDA, which is intended to help consumers balance what they eat each day. For example if it had a 50% by the total sugar, that would mean that one serving of the product contains half the amount of sugar that one should have in a day. However, the %Daily Value for the sugar is completely missing. This is the case with every single American product with a nutritional label for the next few years, making it difficult to see how one serving of a product might affect a person. However, serving sizes are often not very reliable either. Although a product like Doritos has a serving size of eleven chips, most people will often consume many more in one serving. A large part of H2Operation’s goal includes presenting everyday consumers with a daily percentage for the total amount of product in a bottle or package. The best products to consume in moderation are sodas, energy drinks, and fruit juices. Sodas are perhaps the most obvious of the three. These often include very large amounts of sugar and should only be taken on special occasions. Otherwise, they are probably best to avoid, considering the high levels of sugar in other areas of our diet as well. Energy drinks, such as Rockstar or Monster, are also typically very high in sugar, often containing more than what one should have in a day in a single product. Most energy or sports drinks contain around two thirds of the sugar in sodas, so they may seem to be marginally healthier choices, but should still only be taken moderately, perhaps during extensive workouts. The last of the big three are fruit juices. Surprisingly enough, about 50% of our fruit is being consumed through juice, meaning that we are juicing half of our fruit. Perhaps they are such a large part of our diet because they have been advertised as “healthy products,” with words such as “natural” and “fruit,” however, they are often still quite unhealthy. Although often high in vitamins, this is for a number of reasons. For example, they are also often very high in sugar, a key ingredient in making the “healthy” products taste good. Also, when juiced, much of the “healthy” parts of the fruits, such as the fibers, which counteract the negative effects of the sugar, are removed, making the remaining product a concentrated form of the arguably “unhealthy” parts of the fruit. Lastly, satiety plays a key role in the “healthiness” of fruit juices. Arguably, one would feel much fuller after consuming three oranges as opposed to the single glass of orange juice those three oranges would make. The fibers and the “bulk” of the oranges would help to let us know when we are full, whereas we could drink large amounts of orange juice and still feel the same. Non-caloric sweeteners have become a bit of a gray area in terms of healthiness and their relation to sugar. Although they don’t have the same obvious effects as sugar, these sweeteners may cause issues of their own. Essentially, these sweeteners cause people to develop the mindset that they can take in more sugars and calories than they would otherwise consume. First of all, they do not trigger the parts of the brain that cause satisfaction in the same way that regular food or drinks would. Secondly, because they do not contain calories, consumers often feel that they have made the healthier decision and that they are therefore able to consume other unhealthy food or drink items to make up for what they did not consume thanks to the sweetener. Frankly, there currently isn’t enough research concerning the long term effects of sweeteners to call them perfectly safe. In the future, the relationship between sweeteners and diseases like cancer will likely become clearer. After all, most of them are relatively new, unnatural substances with uncertain effects on the human body.